Individuals who are living with fibromyalgia may experience a myriad of symptoms, including widespread musculoskeletal pain, sleep challenges, memory problems, mood instability, headaches, and fatigue. These issues vary in degree, depending on the individual, but are widely reported by those with the condition. The onset of fibromyalgia often occurs after some kind of physical trauma is sustained, such as after surgery, an infection, or some kind of significant stress. There are also cases where the onset of fibromyalgia begins very slowly and then gradually increases in significance over time. There is not yet a cure for fibromyalgia, but there are some prescription medications that can offer some relief. Research has also shown that relief can be obtained through movement practices, stress-decreasing activities, and relaxation techniques. In light of this, practicing yoga is a great way to work with fibromyalgia, since it combines physical movement, stress reduction and relaxation practices. For yoga practitioners suffering from fibromyalgia, it’s important to remember the different systems impacted by the condition so that you can address these needs during practice. Individuals with fibromyalgia might experience pain throughout their bodies, which is usually described to feel like a dull ache. Research indicates that fibromyalgia actually causes pain to be more intense, which can be disruptive if not debilitating. Individuals with fibromyalgia often do not sleep well and will awaken in the morning still feeling tired. They are often awakened throughout the night due to pain. They may also suffer from a mental fogginess that makes concentration difficult. Fibromyalgia can also cause headaches and TMJ. For creating a fibromyalgia-friendly practice space, be sure to have lots of props available. Blankets, blocks, bolsters and even chairs can create a supportive practice that will allow the individual to minimize pain and be able to relax more fully. Determining what time of day the pain is less intense can help to create a consistent and sustainable practice schedule. Being mindful of not moving too quickly, and watching for lightheadedness during movement and transitions, are important foundations to a movement practice. Practice movements that take your joints through their range of motion. Maintaining healthy range of motion is important for everyone, but especially those who may find more strenuous movement difficult due to fatigue. Start with dropping your head and moving it from side to side. Do some seated Marjariasana (Cat-Cow Poses) for spinal and pelvic mobility. Rotate your wrist and elbow joints in each direction. Flex and extend the fingers. Draw your knees in toward your chest either from a seated or lying down position. Do hip circles while lying down or in Bharmanasana (Table Top Pose). Flex and rotate your ankle joints. Point and grasp your toes. 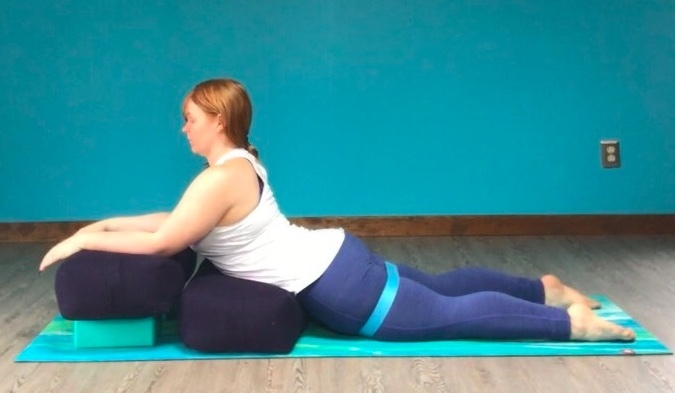 Practice the four movements of the spine; flexion and extension, as in Cat-Cow Pose; rotation, as in Parsva Balasana (Thread-the-Needle Pose) or any simple seated twists; lateral movements, as in Parighasana (Gate Latch Pose), or you can practice lateral movements from a lying down or seated position. Practice passive forward folding poses, such as a seated forward fold with your head placed on a chair or on blocks. Sitting on the floor in front of a chair, fold forward from the hips while keeping the spine long. Place your head on the seat of a chair or on stacked blocks. Place your arms on blocks alongside the body or fold them, placing them on the prop being used for your head (a chair or blocks), and allow your head to come to rest on them. Practice supported and passive backbends such as Salamba Bhujangasana (Sphinx Pose). Lie on your abdomen on a yoga mat. Place a folded blanket under each forearm and one placed under your pelvis to create extension in your spine. Ground your knees to lift your torso up into Sphinx Pose. Hold the backbend while breathing. Lightly press down through the knees and tops of your feet to keep pressure out of the lower back. Lower down onto the mat to rest and then repeat. Slow yogic breathing can help reduce the intensity and impact of pain. Breathe in and out through your nose and slow your breath down to be a couple of seconds longer on both the inhalation and exhalation. Focus on the breath flowing in and out of the nose, using the exhalations to help release tension and pain and the inhalations to create greater awareness of sensations of the body and mental space. Practice supported relaxation poses such as Savasana, utilizing lots of props. Place support under your back, the back of your knees, your arms, and the back of your head to allow for greater comfort so that you can stay a long time in Savasana. Progressive relaxation practices allow the practitioner to see where pain and tension are being held in the body. When you can identify areas of tension, it’s easier to begin to relax them. This practice also provides a tool that you can practice on your own, especially at night when you wake up in pain. Do a slow scan of the body, starting at the head and working downward. Check in at each area and notice if that area is relaxed. Take at least a full breath cycle focusing on relaxing on the exhalation before moving to the next area of the body. Meditation and relaxation practices can help with psychological stress reduction, physical stress reduction, and balancing the nervous system. Meditation practices help the practitioner focus on quieting the mind and learning to separate pain from the actual psychological response to pain. Learning how to manage pain sensations through meditation can be hugely beneficial. Try a short meditation focusing on your breathing: Follow the flow of the inhalation and exhalation while noticing the passage of the breath across the skin just below the nose. This will help keep the mind focused. Study with YogaUOnline and Deborah Wolk - Principles of Therapeutic Yoga for Back Care. Emily is passionate about yoga, anatomy, and sustainable movement. She is a yoga teacher, IAYT certified yoga therapist, and massage therapist. Emily has created both a 200 and 300-hour yoga teacher training program focused on therapeutics and a solid understanding of how yoga asanas can be adapted to fit anyone's needs. She also has written CE trainings to help teachers fill in the gaps after graduating from Yoga teacher training and their real-world experiences. Her belief is that Yoga is not just for skinny, flexible people. Yoga is for everyone regardless of size, age, and health. One of her goals is to help yoga and movement teachers gain high-level training and education so they can in-turn change the world through yoga. She has over 2500 hour of training and well over 4000 hours of teaching experience. Her teaching has ranged from working with professional athletes to those confined to chairs.